Our new president recently created a travel ban preventing Muslim refugees (who have been vetted for longer than any of his cabinet nominees) from entering the U.S. He also wants to change the focus of the government’s counter-extremism program to focus exclusively on countering Islamic extremism. Refugees from the seven banned countries have carried out exactly zero fatal terrorist attacks in the U.S. So how does it feel to be Muslim in America right now? Sagirah tells us. My name is Sagirah. I’m from the great city of Minneapolis in Minnesota, land of the Anishinaabe and Dakota nations, birthplace of Prince and many lakes. I’m a writer by trade. Currently I’m working on my first book of poems loosely based on my upbringing and experiences as an African American Muslim woman. I’m planning on calling the book “Bean Pie” (a sweet pie made of navy beans and popularized by the Nation of Islam during and after the civil rights movement) to pay homage to both my religion and my culture. I’m 27 years old. Minneapolis has a large Muslim population, but it’s still a primarily Christian state. How do people generally react to your faith? There are so many Muslims in our lovely city I think in some ways Islam is a norm here. That was not always the case. Compared to other large Midwestern cities, the Muslim community in Minnesota is still relatively new/young. I think the arrival of the Somali community throughout the 90’s & 00’s really helped normalized the visibility of Muslims in the Twin Cities. Growing up in the 90’s I felt really grateful for that personally, because I never had to search very hard to find community. After September 11th, things shifted for our communities in a way that made being visibly Muslim—complicated or dangerous, even in the Twin Cities. Again, thanks to the visibility and the sheer size of the East African Muslim community in Minneapolis, I was blessed to find other Muslims almost everywhere I went. Older Muslims, closer to my parent’s age tell me this was not always the case. How did you feel when Trump came to visit Minnesota and made his comments about Minnesota “suffering” because of our Somali refugee population? I don’t like even thinking his name…The president obviously has not spent very much time in Minnesota or Minneapolis. I read the Somali-American community is among the fastest assimilating refugee group in Minnesota. They are among the largest communities contributing to our local economies. Anecdotally, if you look around the Twin Cities, you know this to be true. There is a huge entrepreneur drive in their community that I believe adds to the quality of life here. In addition, I don’t know how Minneapolis ever survived without the contribution of the Somali community or other new immigrant and refugee communities like the Hmong, Tibetan, or Oromo communities. Minneapolis is now a global metropolis with a thriving overall economy. The only thing Minneapolis suffers from are economic and education disparities that negatively impact communities of color in Minnesota (African Americans in particular don’t benefit from Minnesota’s thriving economy in the same way White Americans do). Also, Minnesota struggles in providing solutions to address the extreme poverty experienced in parts of rural Minnesota. Those people often get erased or completely ignored in these conversations, I believe those communities suffer due to the ruthlessness of wealthy business men like our President who ignore or abuse their communities in order to turn a profit. What was election day like for you? What I imagine living in Jim Crow America was like: sucky. Have you noticed a shift since he’s been elected? I’m so grateful to be living in the city I live in. With all our problems, Minneapolis is the type of place where most people try to show up and support each other. I haven’t felt particularly unsafe, but I’m also not a Hijabi anymore. I stopped wearing the headscarf full time when I was about 21. I think I felt more scared being a hijabi at after September 11th. That said, I get nervous and extremely protective of my Hijabi friends and family members. I’m even protective of random Hijabi strangers in public spaces, when there aren’t very many Muslims around. You hear so many scary things happening to Muslim women in particular. Because I have experienced some of those things personally, I’m always prepared to defend my sisters if some nut-job tries harassing them. Have you made any changes since the election? Not really. 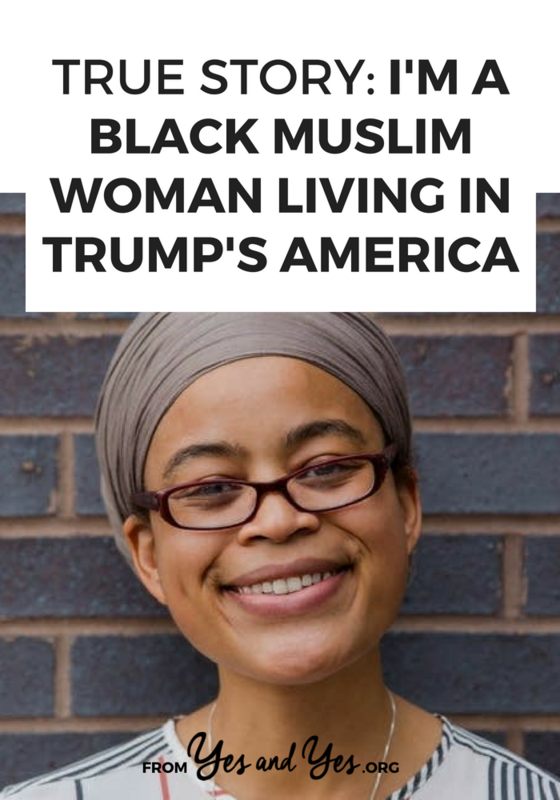 To be honest, as a Black American Muslim woman, this president’s version of America is a version most Indigenous and Black folks were already familiar with. For that reason, much of the way I lived my life already reflected my deep rooted Islamic values to speak up and resist injustice wherever it is and in the best way I can. One personal change I did make though was my New Years resolution. My 2017 New Years resolution was to travel more (I’ve only ever been to Canada, once), but I am definitely not traveling outside of the country anytime soon…So there’s that. If anything, I feel even more connected to my faith and to my beautiful community. I’m grateful and blessed to be a part of the ever diverse Muslim community. A lot of people aren’t worried about Trump because his policy changes “won’t affect them.” What would you say to those people? It affects you. Just recently, I read an article that said if our President built a wall along the Mexican/U.S. border, farmers in Minnesota would suffer as 1/3 of their exports go to Mexico, The wall would create an added financial burden that our farmers aren’t capable of bouncing back from. The whole world knows the potential consequences of this president, and world is watching. Americans are charged with a moral responsibility to ensure that we do not repeat or re-create the wicked history that brought all of us (regardless of where our ancestors came from originally) here to this point in time. With the exception of the Indigenous Nations that once thrived on these stolen lands, and the African Slaves that were forced against their will to build the economies of the Americas, America was always supposed to be a safe haven for immigrants and refugees. The eyes of the history books and the world are upon us, we have the power to build an America that is truly a safe haven and democracy for all, if we truly want to. That takes folks who disconnected from the past and current atrocities of this country to take action. I can’t convince them to do this. A supporter of our president would never listen to someone like me in a sincere way. However, someone they know can. I have yet to find, a supporter of this president who doesn’t have a friend or family member who is on the opposite end of the spectrum. I truly believe it will take families over a holiday dinner or, during a church brunch, having the courage to have dialogue with each other without judgment and to humanize the experience of people like me and my community under this administration.I think this is an important first step in change and requires kindness and persistence. Black history teaches us that even after emancipation Black people were (and still are) actively discriminated against. Why? Because even with the change of federal law (which by the way didn’t protect the Black community from Share Croppers, Jim Crow, police brutality, and what have you) the vast majority of the White Americans still harbored bigotry in their hearts and mindsets. They passed these views down through the generations. Even if this president and his entire administration is impeached, we’ll run into this problem again if we don’t deal with the roots. The problem and the solutions begin at home. Do you have a plan for navigating the next four years? Leaving the U.S. is blasphemy for me personally, because of what my ancestors suffered to bring me into this world, to give me the freedoms I currently experience. I’m not going anywhere. Inshallah (God Willingly), I will continue to stay and protect my Islamic values to stand on the side of human rights for all and to resist injustice in the best way I can. I have hope for this country because my great-great-great-great-grandparents were considered property once, They were not even considered full human beings and now, here I am. My source of power is their legacy and survival, and my faith. I don’t feel the need to fear anything this new president throws our way. My plan is to live, love, pray, resist, speak up, defend, laugh, support, show up and to experience joy in as many ways as possible. How can those of us in positions of privilege best help? If you have family or friends who believe misconceptions or who harbor hatred in their hearts for people like me, start having regular dialogue with them, humanize our experience. Study Black History. Study Native folks histories. Study the Histories of all of the immigrant communities oppressed in this country ( Irish, Italian, Jewish, Catholic, Chinese, Japanese, etc). Spend some time learning the history of Christianity and the Bible. Spend some time learning the history of Islam and the Quran. Spend sometime with your local Muslim community and ask people to tell you their stories. Listen. Teach your family, friends, and children all these histories and about our stories. Save the number of your local representatives and organize community call in-sessions to let them know when you disagree with harmful policies and tell them honestly how you feel, educate them too if you have to. Most importantly, never turn a blind eye to the local injustices happening in your community. Thank you so much for sharing your story, Sagirah. Do you guys have any questions for her? Thank you for sharing your story, Sagirah! All the best! Hi Sagirah, I love that in spite of the dangers and problems that a Trump government can create for you, you are choosing not to give way to fear, but instead to live, love, pray, resist, speak up etc. This is how we all need to respond (including myself who lives all the way on the opposite side of the world in New Zealand). God be with you! Sagirah, what you wrote is an inspiration to everyone out there trying to make a change. Thank you for sharing your story and for being so fierce. Wishing you all the best. What an incredible interview! I watched the election with a friend from Minneapolis and the election of Ilhan Omar (who is from the Somali Muslim community you mentioned) to the Minnesota House of Representatives was one of the few things that night that gave her hope, I think. Thanks for much for doing this interview Sagirah, you absolutely rock!